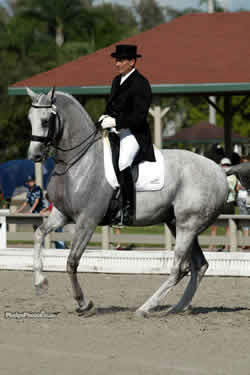 WELLINGTON, FL  November 28, 2003  Denmarks Lars Peters, 38, of Loxahatchee, Florida, riding Danskos Success won the Grand Prix at the 2nd Annual Zada Enterprises, LLC Dressage at the National today with a score of 67.188%. The dressage show runs from November 28-30 in conjunction with the 120th National Horse Show at the Palm Beach Polo Equestrian Club show grounds in Wellington, FL. Its the first time ever he has shown Grand Prix, said Petersen of the gray, eight-year-old, 16.2-hand Danish Warmblood. Petersen and his Five Star Farm have owned the gelding since he was a year old, and though Petersen has done all of the training on Danskos Success, the first Grand Prix still posed questions. I dont know how much I can push him so it was a little bit of an experiment in a way, said Petersen, noting that mistakes in the zigzag were his as he is just discovering how much he can trust his green Grand Prix horse. I backed him off a little bit too much. I could have just trusted him, he said, and then added with a laugh, And I counted wrong twice! Petersen noted that Danskos Success is a very hot horse so the best part of his performance was the way he handled the show atmosphere. He kept his concentration, said Petersen. He can be look-y and he really kept his cool in there. Petersen, a member of the Danish dressage team for nine years, was especially pleased with how Danskos Success performed the trademark movements of the Grand Prix. His piaffe/passage I was really happy with. Lorraine Stubbs, the judge at C, scored Petersens ride at 319 points, and judge Gary Rockwell at B, concurred, awarding 326 points. Earlier in the day, Californian Heather Bender, 39, now of Loxahatchee, Florida, won the Prix St. Georges aboard her Winwood, with a score of 69.00%. Winwood is a flashy chestnut eight-year-old, 16.1-hand Hanoverian gelding. Hes very, very hot  people dont see that in him but hes very explosive, said Bender, citing that last year their scores in the Prix St. Georges and Intermediaire I were erratic due to the explosiveness. The exciting win today was when I went down the side he showed me that hot side and I thought, Uh-oh but hes so much better on the aids I can now put the hotness into the work and get the great extensions. He stayed so soft and honest on the aids. Bender noted that Winwood was consistent throughout the test and easily performs the movements at this level. Its a matter of having him emotionally in the right place so that he doesnt get cheeky on me. Hes so sensitive that if I change how much air I have in my lungs it affects how he goes, said Bender. The judges were in agreement on the test  Gary Rockwell at C gave Bender 279 points and Lorraine Stubbs at B awarded the ride 273.